The Amarok, which will be available as a four-door double cab version from launch with a single cab model to follow in 2011, combines the robustness of a pick-up with innovative technology, high safety standards, excellent fuel economy and Volkswagen standards of comfort, quality and durability.Production of the Amarok is about to start at the Volkswagen factory in Buenos Aires, Argentina ahead of its worldwide launch starting in its native South America in early 2010 and in Europe next summer. The Amarok has a generous payload capacity of up to 1.15 tonnes and maximum towing limit of 2.8 tonnes. Its 2.52 m² cargo area has the largest dimensions in its class at 1,555 mm long and 1,620 mm wide, plus a best in class width between the wheelarches of 1,222 mm, which means that for the first time on a mid-size pick-up, it is possible to load Euro pallets sideways, saving on space. Volkswagen Commercial Vehicles has released the first official images and more details of its new pick-up, the Amarok. 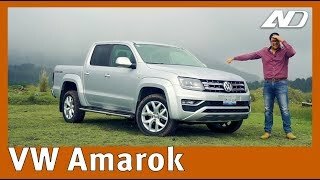 The Amarok, which will be available as a four-door double cab version from launch with a single cab model to follow in 2011, combines the robustness of a pick-up with innovative technology, high safety standards, excellent fuel economy and Volkswagen standards of comfort, quality and durability. Production of the Amarok is about to start at the Volkswagen factory in Buenos Aires, Argentina ahead of its worldwide launch starting in its native South America in early 2010 and in Europe next summer, with first models expected to be in UK Volkswagen Van Centres in September 2010. The official photos show the Amarok reflects the latest Volkswagen design DNA with frontal styling in line with the latest Transporter and Golf. It is 5.25 m long with a ladder frame chassis and will be offered with a choice of rear-wheel drive and switchable or permanent 4MOTION all-wheel drive. For maximum convenience, the switchable all-wheel drive is engaged by the push of a button, and also has low off-road gearing. The full-time all-wheel drive version is a rarity in the pick-up sector, and uses a Torsen differential to distribute drive at a 40:60 ratio to the front and rear axles for excellent vehicle dynamics and high traction, and also ensures that the wheel with the best traction always gets the most power. A rear differential lock is available. Designed to tackle the toughest off-road terrain, the Amarok is offered with an electronic differential lock (EDL) and Off-Road ABS to significantly shorten braking distances in off-road conditions or gravel roads. At speeds of under 20 mph it also activates Hill Descent Assist to control hill descents by using selective braking interventions. Furthermore, the ESP Plus system includes Hill Hold Assist, which prevents the vehicle from rolling back by holding it in place on inclines until the driver presses the accelerator pedal. Under the bonnet there will be a choice of two 2.0-litre fuel-efficient, Euro5 compliant, common rail TDI engines producing 163 PS, with torque of 400 Nm at a low 1,500 rpm, or 122 PS with maximum torque of 340 Nm from 2,000 rpm. Both engines have a six-speed manual transmission and will have impressive fuel economy with low emissions to make the Amarok the first all-wheel drive pick-up in this class offering CO2 emissions of less than 200 g/km. Like the new Transporter and Caravelle, the Amarok has a gearchange indicator to help drivers achieve the best fuel economy, which with an 80-litre fuel tank should offer a range of over 600 miles. 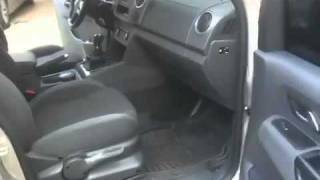 UK prices and specifications will be confirmed nearer the Amarok’s UK launch. The range is expected to comprise a standard model for customers who need a pick-up that is as robust and practical as possible, to offering all the latest luxury items expected for those using Amarok as a leisure vehicle. An extensive accessories programme will also be offered for the Amarok – from a styling bar and running boards, through a cargo cover and Multi-Connect load securing system to a selection of stylish alloy wheels. The large and ergonomically designed interior is the largest in its class and in many ways resembles that of a Volkswagen passenger car. Easy entry, lots of headroom and ample legroom for passengers on the rear bench seat make the Amarok a fully-fledged five-seater. If only two people are travelling, interior storage space can be increased by folding the rear seat. Key markets for the Amarok include South America, South Africa and Australia; in these countries, because of their versatility, pick-ups are some of the most sought after recreational and commercial vehicles. Thanks to its efficient drive technology and tremendous versatility, the Amarok is also expected to be a trendsetter in the contemporary pick-up class in Europe. Volkswagen will be putting the Amarok to the test as a support vehicle in the tough Dakar rally in South America in January. In the meantime, to see more of the Amarok and to sign up for Amarok news and events prior to its UK launch, go to www.volkswagen-vans.co.uk/amarok/.